On a windswept, darkening afternoon in December 2000, I brushed the snow away from the marker of my mother¹s grave. With each sweep of my gloved hand, the raised lettering of the simple plaque gradually became visible, showing her name, ELEANOR FREEDMAN, and the inscription our family had chosen: A SPECIAL PERSON. It had taken me some time to find the marker, even with a map from the cemetery office and a computer print-out designating the exact location like the block-and-lot number in a suburban subdivision. I had not visited the grave in twenty-six years, since another December afternoon, when my family buried her. I could still see, after so many years, the tears sliding out of my father¹s unblinking eyes. I could still hear my sister¹s howls of grief. But my memories of my mother herself had grown vaguer and less distinct over time. I could not remember the timbre of her voice or the pattern of her inflections. I could not summon her face without a photograph. What I did recall in all its shameful detail was the only visit she made to me at college, and my command that she sit rows apart from me in my classes, that we pretend to be strangers until we were safely blocks away from the classroom building. I was just eighteen then, two months into my freshman year a thousand miles from home, and in the full thrall of this new independence. She was already dying of cancer, pulling me back in love and obligation to the excruciating spectacle of her demise. From that day until this one, my memory of her illness, of our family¹s death-watch, had eclipsed all the other memories of her existence. Now I was forty-five, the same age my mother had been when a doctor found that first lump in her breast. I was only five years younger than she had been at her death. I was more than a decade into my marriage, as she had been in hers. I was the father of two children who looked at me, as I had looked at her, only as a parent, not someone with a whole autonomous life, most of which had preceded their arrival. And, as if my own wish during college were taking revenge on me, I had discovered that my mother was more and more a stranger to me. Besides having been my mother, besides having been my father¹s wife, besides having been someone who died miserably and died young, I did not know who she was. In the quarter-century since our family had interred her ashes, I had become my father¹s son, by choice and by default. My stepmother had been part of our family, and my life, for more years than my mother was. I had not even gone to the cemetery this bleak afternoon with the intent of visiting her grave. I was there instead for the burial of my father¹s sister Clara, a devoted anarchist from childhood until her dying day. On her part of the family tree, the Freedman part, lives were lived in bold political engagement. My grandfather and namesake had been sentenced to death as a teenaged radical in Poland; he fled from prison to England during a workers¹ uprising and bought a steerage ticket to America on a ship called the Titanic before deciding to sell it to a friend. Out in the Jersey farmlands, he raised his children in an anarchist colony with its own experimental school, and every year I attended the reunion, soaking up the tales of strikes, May Day parades, and Woody Guthrie concerts. That my grandfather Samuel died fourteen years before my own birth made him only more vivid, nearly mythological, in my imagination. My mother¹s people, the Hatkins, formed the conventional part of the extended family, the scufflers and schleppers in an East Bronx walk-up, relieved to make the rent every month. Fluent only in Yiddish, and disinclined to wear her hearing aid, my grandmother Rose had proven an impenetrable figure during my childhood. Sol, my grandfather, fussed and doted too much; my strongest memory of him was a day when I was eight or nine and he took me sledding, and kept insisting I rest between plunges down the hill. Years later, as a journalist, I had chanced upon a word to describe the whole clan, a bit of black slang, of all things. Drylongso was the term, meaning something that has been left dry for so long it is now ordinary as dust. An odd thing had happened, though, during the last few months. 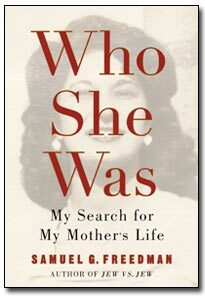 In conversations and occasional speeches, I found myself mentioning stray details from my mother¹s life – her pride when Bess Meyerson was the first Jew chosen as Miss America, her dancing in the streets when the United Nations voted statehood for Israel. I wasn't even aware at first of how often I was telling these stories until an old friend pointed it out. "I've known you twenty years," he said one night. "This is the first time I've ever heard you talk about your mother." His words jolted me. I had to ponder what my reflex to speak of her meant. I carried that mystery with me from place to place over the weeks, and eventually I came to an answer. I realized that, at last, I wanted to discover my mother's life. I wanted, almost literally, to claw at that frozen cemetery ground, to exhume the soil flecked with her residue, and from it to conjure the past. She and I had been complicit in the sin of forgetting. For my part, I had built an identity on the rejection of my mother, on the imperative of denying all the softness in myself. On my first day of kindergarten, a block short of the schoolyard, I had ordered my mother to turn around and let me arrive alone. I spent an hour getting home that day, crossing the same few streets again and again, delirious in my show of autonomy. A straight line ran from that day to the day at college. The same straight line ran through every day when I so easily could have visited the grave and never did. The only way I could rationalize my mother's death at fifty, the only way I could make it bearable, was to transform it into some kind of precondition for my own adulthood, as if her coffin were my chrysalis. When I eavesdropped on my wife talking every day to her mother, when I read novels like Anywhere But Here and watched movies like Tumbleweeds, I marveled in a judgmental and superior manner about mothers and daughters and their limitless capacity for entanglement. Love or hate, or both at once, the passion flowed, and it flowed without cease. What I understood firsthand was distance. I dared not remember my own dependence, feeling homesick at sleep-away camp or needing my mother's help with my algebra homework. I had delivered the main eulogy at my mother's funeral, and yet I no longer could recall what I said, only the fatalistic line I quoted from Omar Khayyam: The moving finger writes; and having writ, moves on. One night about two years after my mother died, I treated my college girlfriend to dinner at a fancy restaurant, and as we took our seats in our let's-pretend dress cloths, I realized I had eaten in the same place with my mother during her visit. I began to cry, as I had never cried at her death or funeral or burial. I have cried since then for others – for a friend's older brother killed in an Air Force training flight, for an editor and mentor felled by AIDS – but I have never let myself cry again for her. My mother, I was sure, would have wanted my tears. She would not, I was equally certain, have wanted me to explore her past. While I had never asked very much about her life before marriage and motherhood, neither had she ever volunteered the information. I knew she had been some kind of ace student, because her jewelry box held a few academic medals. I knew in a general sense that she had been the family rebel, but I had no clue as to how and at what price she had purchased her freedom. Growing up, I had seen how she treated her father with patient indulgence and her mother with brusque contempt, which was more than returned in kind. During one of my grandmother's rare visits, my sister innocently walked into a bathroom to find the old woman methodically breaking every tube of lipstick my mother owned. One day when I was in eighth grade, my mother and I were stopped at a traffic light on the way home from Burger King. She met my eyes in the rear-view mirror, the same way she had a few years earlier when she explained the facts of life to me, and said offhandedly, "Did I ever tell you I was married before Dad?" I said no, and the subject was dropped, never to reemerge. The same kind of ignorance, perhaps willful or maybe just lazy, alienated me also from my mother's parents. It closed me off from all the history and heritage they embodied, all the experience, all the knowledge. From my mother's example, I absorbed a sense that Rose and Sol were insignificant, irrelevant in all ways except the genetic, not worth my curiosity or my questions. I accepted without elaboration the explanation my mother offered for my grandmother's leathery disposition: Bubbe lost her whole family in the war. Not even the simplest Jewish folkways penetrated me. On Rose's visits to our house, she often brought homemade blintzes, which she had wrapped in foil, frozen for preservation, and loaded by the dozen in a small cardboard box. All through my childhood, I gnawed them straight from the freezer like ice-cream pops, completely unaware that blintzes were meant to be cooked and eaten hot. When I first noticed blintzes served that way, at the sole Jewish deli near my college campus in Wisconsin, I inwardly snickered, thinking this was one of those Midwestern atrocities against ethnic food, like shrimp and pineapple on pizza. My mother died three weeks before I got hired for my first job as a professional journalist, interning on a small daily newspaper. I learned first how to report events I had witnessed or that had occurred only hours or days before, the robberies and ballgames and Board of Ed meetings. Gradually, over decades, I taught myself the kind of research a historian practices, the method of recapturing vanished times and remote lives. I had utilized those skills to write about other families in other books. Now, shivering in the December twilight, fingers and toes going numb, I decided to apply them to my own flesh and blood. My mother's two siblings were still alive. I knew the names of three or four of her girlfriends from high school, as well as a couple of beaus, though I had no way of knowing who lived where or was even alive. Some time in the previous few years, while rummaging through a storage area beside my childhood bedroom, I had stumbled onto a milk crate containing a half-dozen short stories, autobiographical in tone, each bearing a rusty paper clip and a rejection letter from The New Yorker or The Saturday Review. She had written them, evidently, for a class at The New School. As far back as I could recall, she was always taking a class in something – painting, sculpting, classical guitar, creative writing. Or she was until she required her days to be available for the oncologist. For most of my childhood, we lived in a spacious brick house with a slate roof, sun porch, and two-car garage in the suburb of Highland Park, New Jersey, a bedroom community for Rutgers University. Like some odd cross between Horatio Alger and Alexander Berkman, my father David had grown from anarchist origins into a successful capitalist, building a storefront machine shop into an international corporation manufacturing microbiology equipment, much of which he designed himself. He and my mother read I.F. Stone¹s Weekly, canvassed for Gene McCarthy, and signed petitions for SANE, the ban-the-bomb group. They also firmly believed marijuana led to hard drugs and rolled their eyes at the white professors on the next block who subscribed to the Black Panther newspaper. Their marriage was better than some and worse than others; they argued but always managed to reconcile, if only out of shared commitment to their children. I was the oldest of three, with a sister, Carol, only eleven months behind me, and a brother, Ken, three years my junior. Until everything changed, my mother had led a Cub Scout troop, sewn Halloween costumes, baked birthday cakes in the shape of spaceships or choo-choo trains, and hopped the Penn Central to Manhattan for Broadway matinees. She also descended, in rare and unpredictable times, into bouts of rage or gloom. When I was ten, our family was attending a pot-luck lunch at the local branch of the Workmen¹s Circle, a Yiddish cultural organization, when one of us children accidentally knocked several plates of food off the table. My mother stormed out and did not rejoin us at home for hours. Tucking me in that night, my father explained that she'd been moody since quitting cigarettes a few months earlier. It had taken a case of pneumonia to scare her off a three-pack-a-day habit. On some sporadic nights, I found my mother asleep at the kitchen table, face down in the Times, a glass beside her. Once or twice, pulling a coat from the hall closet, my hand brushed against a cool cylindrical shape on a back shelf. Upon further inspection, the object turned out to be a flip-top canned cocktail. I returned it to its niche and said nothing to anyone. I was fourteen years old on the summer Sunday my father first told me about my mother's diagnosis. She had begged him not to, but I was the eldest child, the one most able to accept the burden, the one who would have guessed soon enough that something was wrong. After I heard the news, I got on my bike and rode for a long time alone through the Rutgers campus, a pretty empty place that time of year. Behind my impassive eyes, I imagined my brain exploding into a mushroom cloud. On many nights in the weeks to follow, when I should have been asleep, the agitated voices of my parents seeped out of their bedroom and down the hallway into mine. Laying in bed, beneath my Mets pennant and Abbie Hoffman poster, I gathered what the dispute was all about. My father was pressing my mother to have a mastectomy. She was resisting. They had already lost valuable time, he warned her, all those months the gynecologist had been assuring them that the lump was benign. They had to act now, and they had to act radically, before the cancer spread. "I can¹t do it," my mother said, her tone distraught. "I will not be mutilated. I will not be disfigured." Eventually, she compromised on submitting to a lumpectomy. As a family, we always had maintained a relaxed, casual attitude about the human body, shuttling through the main bathroom and the upstairs hallway in various stages of undress. Now, however, my father took me aside to explain that I must be careful never to barge in on my mother. She was ashamed of the scars on her breast. There was no convincing her she was still attractive. And even at the cost of her vanity, the lumpectomy soon proved quite literally too little, too late. That year, my sophomore year of high school, I learned the word metastasize. My mother commuted into Manhattan for rounds of chemotherapy and radiation. When I was a junior, she underwent a hysterectomy, in the hopes that stanching her hormones would slow the advance of the disease. Throughout, my mother wanted nothing more fervently than for her family to ignore the battle even as she fought it. When she went into the city for treatment, she brought me back containers of beef stew from Macy's for school lunches. Within two months of the hysterectomy, she resumed playing tennis, hot flashes be damned. She worked part-time as a sales rep for an educational publisher, a job that could be fit around medical appointments. In the summer of 1973, my last summer before college, our family traveled to Greece, the country she always had longed to see. She hiked through the Parthenon and Delphi and exulted in our al fresco dinners of souvlaki, stuffed vine leaves, and ouzo. When my father grew a mustache on the trip, she chided, "Dave, you look like Nasser." Last week Mother went to have an X ray scan of her hip...for the detection of possible cancer in that area...The tentative results appear to be that there may be some positive cancer activity in her bone tissue...She seems quite depressed about the whole matter, which you can understand. The X-ray group took a lot of her head & neck to see if there has been any spreading to her neck and skull bones. Regarding Dr. Escher¹s and Dr. Zucker's comments, I have asked them the very same question you have asked a number of times. Their answer is very simple – they just don¹t know and don¹t have any idea. It is really not possible for them to predict what the future will be, but that we must understand the nature of her illness and that it is serious and that it is not curable. In the spring of 1974, my mother set about planning her own fiftieth birthday party. The Saturday night closest to the actual date happened to fall just between my week of spring break and the onset of summer vacation, and I complained that I didn't want to make yet another trip home. My mother, wisely, did not push the issue with me. It fell to my father to apply the correct pressure. "She bemoans the fact you might not be there," he wrote me, "even though it may be her last birthday." And, of course, that was the real issue. In an almost physical way, I felt my mother's disease pulling me back home, some giant magnet dragging me from my parallel universe of willful undergraduate oblivion. I wanted to put off the reckoning as long as possible. As it turned out, the party was a blast. The house hummed with company, three generations of relatives and a lifetime's worth of friends, and everybody got looped on my uncle Ziggy's champagne-and-Cointreau punch. I found a different uncle, this one a painter, smoking pot in the laundry room, while in another corner a cousin by marriage was making out with somebody's husband. My mother had designed the invitations herself, with the silly doggerel, "Be thrifty, no gifty, to rhyme with fifty." She cooked up platters of moussaka, her new favorite since our trip to Greece, and draped herself in a print gown. Beneath it, hardly anyone knew, she had a cracked rib, the latest consequence of her cancer. Sometime well after midnight, the bacchanal wore itself out. I never saw my mother look so joyful again. A few weeks after the party, I came home for the summer, and in some ways the summer of 1974 never has ended for me. It seared into my brain the sight of a broken woman – depleted, defeated, desiccated – to whom as a loyal son I was shackled. It seared into my brain every guilty effort I had made at escape, especially that day on the Wisconsin campus when I pretended not to know her. In the years since, friends have told me that I judge myself too harshly. They have told me any mother would have understood a teenaged son's display of emancipation. As a parent myself, I could accept these explanations at a cerebral level. In my soul, though, I still carried the stain. All of those friends who had offered me reassurance – no, expiation – had grown into adulthood with mothers still alive and available for reconciliation. I stood frozen in the posture of rejection, frozen by my mother's early death, the eternal punctuation. As I beheld her grave in December 2000, I wanted so fiercely to know who else she had been. I wanted to know about the family and the home and the neighborhood and the world in which she had grown. What did it mean to have come of age during the Depression, World War II, the Holocaust? I no longer could settle for the routine answers – We were poor but everybody was poor...Bubbe lost her whole family. What did those giant forces, forces that shook a planet, mean to my own mother? How did they shape her, or misshape her? I harbored no desire for cheap sentimentality or easy solace, but neither did I seek a bill of indictment, a lurid litany of dysfunction. The questions that seized me were of a more quotidian sort. Who was my mother before she became my mother? Whom did she love? Who broke her heart? What lifted her dreams? What crushed her spirit? What did she want to be? And did she ever get to be it in her brief time on earth? My mother should have lived long enough to write her own story, the story she was groping toward in those yellowing pages I had discovered in the storage area. She was smart enough. She was skilled enough. She was young enough, young enough that she still should have been alive now, a graying grandmother in her late seventies, taking literature courses at Elderhostel. The duty never should have fallen to me, and yet I welcomed it, having failed in so many other filial duties. After all my years of rejecting her, after all my years of posthumous neglect, I finally had found the means of penance. As dusk settled over the cemetery, I picked my way between the headstones and back toward the mourners still at Aunt Clara's grave. It was time to leave. It was time to pick up the tools of my craft, the pens and notebooks, the telephone and computer. I thought of them now as an archeologist's instruments, as if I were scraping up the dirt of antiquity one spoonful at a time and sifting it through wire mesh to find what chip of pottery or fragment of bone might remain. As I collected the pieces and tried to assemble the skeleton, I told myself I wanted only one thing: to see my mother clear and true.